We are delighted to present the first in a three-part series on this year’s Hometown Heroes. Our 2018 honorees will be celebrated at our annual awards breakfast on Thursday, September 20th at the Computer History Museum. Click here for more information and to reserve your seat! California native Brian Leong grew up in Oakland and attended the University of California at Berkeley for his undergraduate degree. After college, he worked in China for a Christian-based educational organization, teaching English at a Chinese university. 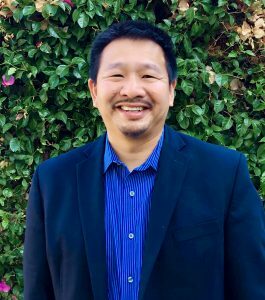 He returned to California to serve as the organization’s China director and to complete a Master of Divinity degree at Fuller Seminary in Pasadena. What led you to the ministry? I first felt my call to the ministry during my last year of college. Up until that point, I was preparing for a career in broadcast journalism. I did an internship at my church that same year and realized that I really loved ministry work, that it made me feel like I had a larger purpose. I’ve been with Lord’s Grace Christian Church in Mountain View for the past 12 years; we have 3 congregations covering three languages, English, Cantonese and Mandarin, and over 700 members. It’s one of the larger Chinese multi-generational churches in Silicon Valley and we’re proud to be celebrating our 45th anniversary this year. How did you get involved with CSA? I started volunteering at CSA about 10 years ago. We had a project at the church called Heaven’s Scent where we gave congregants $100 apiece to go out and serve the community. One of our members contributed their $100 to CSA and started volunteering in the Food & Nutrition Center. I soon followed suit. The experience piqued my interest so I joined CSA’s Alpha Omega Task Force which really opened my eyes to the issues of homelessness. I knew that this was an area that I wanted to focus on. I started contacting other local congregations in an effort to get clergy to focus on these issues. It’s been challenging because clergy are very busy, and we all tend to focus on our own congregational needs. I am delighted that we were able to pull together a group that now meets monthly at City Hall where we pray together and talk about these issues. What is Move Mountain View, the nonprofit that you started earlier this year? The agency was formed so churches could collaborate with the government to serve the community. For our first project, we brought together nonprofits, city and county governments and churches for Lots of Love, a 2-year pilot program to help people living in their cars have a safe place to park in the evenings. Beginning this past July, individuals and families participating in the program can safely park their cars from 7:00PM to 7:00AM at two local churches. The program is going well so far, and we are hoping to see it grow. It’s not a total solution, but it’s a start. How does it feel to be a CSA Hometown Hero? Last year was the first time I attended Hometown Heroes. I remember thinking at the time how amazing it was to have so many community leaders together in one room to honor individuals and organizations helping a largely invisible population. Frankly, I am a little awed to receive this award as there are so many others in the community who have contributed to these efforts. I am honored to accept this as a representative on their behalf. What has been the most gratifying is seeing other congregations get involved and to work in unison with CSA and city and county staff. I look at what we have done so far, and I am excited about what comes next. There is so much that the faith community can accomplish to address poverty and homelessness when we come together to serve this vulnerable population.